I come across TONS of great Décor on a Dime ideas and don’t have the time, or budget (or space in my house) to reproduce them myself to post. So I will just share them with you and you can pick your favorite to do! I am completely in love with this 2-tone finish right now! I absolutely LOVE the dark walnut stain in contrast with the white. Wonder what I can redo in my house to look like this? I love the dresser redo, but think I love her decor even more! Nursey wall art at Honey We’re Home. She made these by cutting pages out of the book “I Love You More” and framing them! I think that is adorable for a little boy’s nursery! I just LOVE the board and batten idea!!! 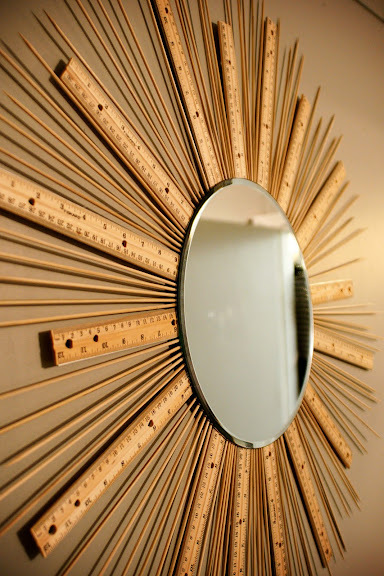 I have seen several people use beadboard in their homes, but I love this idea even better!! One of these days I'm gonna try some of this stuff! Thanks for sharing! The wall art is a neat idea, I just wouldn't recommend hanging it over a crib, no matter how secure you think you have it. I've been reading your blog for a long time, but have only posted maybe once or twice! I just wanted to say that my favorite new thing is your Decor on a Dime posts! While I definitely still read your deal posts, I keep coming back to look at your Decor on a Dime posts over and over. And now have a new addiction! Thanks to your linking to other sites, I've been non-stop reading some of the sites you linked to here! Over the past few days, I read through almost all of Just a Girl's blog- mostly in the middle of the night while I was up anyways feeding my 1 month old!! I have a million ideas and a list of projects I want to tackle now! I started a couple blogs awhile back and with this inspiration, I'm hoping to start one back up! Now you know how I feel! :) I did the same thing. Was introduced to Thrifty Decor Chick in December and after the holidays, I spent 2 evening reading through her entire blog all the way back to her first post! LOL! Glad you are enjoying the posts - I am enjoying posting them and doing them! Good luck on doing your own projects - maybe try in a few weeks or so during naptime. Start with some simple ones and build up! hello!This was a really marvelous Topics!